While trying to implement a SharePoint 2013 workflow I ran into several snags. This blog will hopefully help anyone else that is running into workflow problems and provide a few solutions. I created a SharePoint 2013 workflow using SharePoint Designer 2013. The workflow was simple. It logged text to the workflow History List (http://your.site.com/lists/Workflow%20History). I wanted to keep it as simple as possible to help debug my error. Once the workflow was created and published I went to an item in the list to manually start the workflow. The workflow would start and then after a few seconds instantly cancel. Checking ULS, no errors appeared, checking the server logs, no errors appeared. I could only find one error. Select the item -> Click the (…) -> Workflows -> Select the workflow you just ran to open it, click the blue information button. The information given is seen below in errors one and two. After researching these errors I noticed there was no simple solution. Each person solved the errors in different ways. 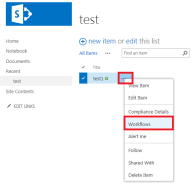 I documented every solution I tried and after doing all of the following steps the SharePoint 2013 Workflow errors went away. For errors one and two follow the below steps in order. The easier solutions are listed first. a. An IIS reset will drop existing connections to your web server for a few seconds. It is recommended to do this during non-business hours. For error three and four you just need to make sure you have plenty of memory on your machine. Once all of these steps are followed you should be in working condition for your SharePoint 2013 workflows.